We need to encourage more sporting activities to thwart drug menace in the State- Deputy Chief Minister, Chowna Mein. 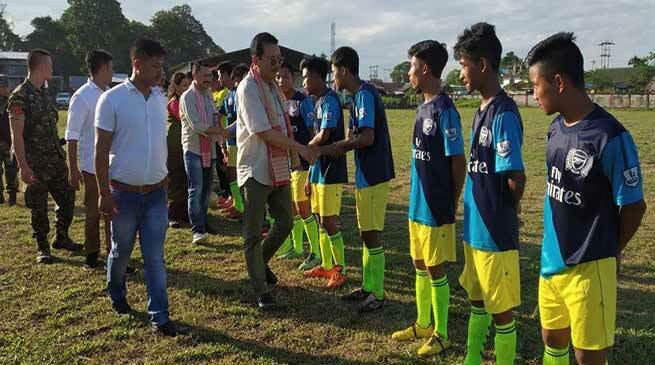 “We need to encourage more sporting activities to thwart drug menace in the State”said the Deputy Chief Minister, Chowna Mein in his inaugural speech during the inauguration of the 4th All Lekang Youth Student Union Football Tournament at Govt Higher Secondary School Play Ground, Mahadevpur today. He lauded the youths for taking interests in games & sports activities and called upon the players to play the tournament with the slogan “Say No To Drugs”. He said that a football stadium would soon be coming up in Mahadevpur while informing that the Central Govt has recently approved the same. He further said that once such stadium comes up in the district, we would be able to host and organise bigger tournaments inviting teams from other districts too. He lauded the organiser, ALYSU for organising the tournament for the fourth consecutive years and continues to do so in future too involving more and more youths. It was informed that 20 football teams are participating in the tournament. The winner will receive a cash prize of Rs 1,11,111/- while the first runner up will receive a cash prize of Rs 55,555/- along with the Trophies.